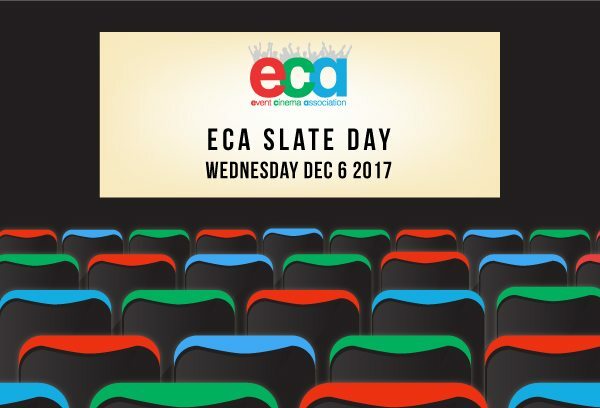 London, UK (November 23, 2017) – A highly focused line-up for the Event Cinema Association’s first-ever industry Slate Day has now been confirmed. Representing the leading names in Event Cinema distribution, the event promises to provide truly valuable insights into the next 6-12 months’ worth of events in the calendar. During the day, each distributor will be showcasing upcoming highlights of their forthcoming content, their release strategies, and box office forecasts and the have the opportunity to make genuinely exciting announcements to exhibitors on specific new titles. Vue’s participation provides the chance to screen theatrical trailers for forthcoming events on their Sony 4K-, Dolby Atmos-equipped big screen. The international audience will be made up of exhibitors and distributors, digital agencies, content owners, marketers, ad agencies, post houses as well as those from home entertainment. Following the presentations there will be a lunchtime networking session with food and drinks supplied by Molson Coors and Rollover. The event has been kindly sponsored by Vue, Cinema Next, Éclair, Motion Picture Solutions & LANsat, Qubewire, Managed Networks and Jack Roe. Other food and drink has been kindly supplied by Coca Cola, Rollover and Joe & Seph’s Gourmet Popcorn. Please email info@eventcinemaassociation.org for details on how to participate. The Event Cinema Association is a non-profit organization overseen by a president and 10 Board Directors comprised of international exhibitors, distributors, content producers and technical providers. It was created to both support and promote the developing market for cinemas looking to offer different types of events to audiences such as operas, ballets, theatre, concerts, sport and special events. The role of the ECA is to provide a united voice for the Event Cinema industry in 41 territories worldwide and promote and support the industry via its ECA Awards, show reels, trailers, conferences, networking events, trade shows, industry reports, statistical data and best practice guides.